So the other day, Google announced it's "+1" service which sounds pretty much like any other "like" type of feature except that is provided for Google Search Results. Which is pretty big deal I guess since Google is close to monopoly status on search - at least in the U.S. 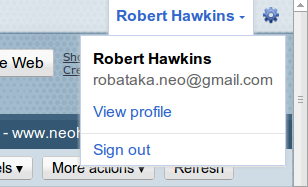 Your plus ones are going to show up on your profile page - this one below is for my gmail google account. I don't really understand how I'm going to give a search result a +1 on the search results page. I won't actually know if I like that link until I click on it and then chances are I'm off the search results window. If that's the case then chances are really, really high that I am not going back to the search results page just to give the link a plus one. They'll need to figure out a way for me to add it once I'm off the page. I get that +1 will have it's own tab on my profile page and that I will be able to control who can see that tab. I also understand that I'll be able to "+1" something from google search results but that +1 option is going to have be placed somewhere else for me to click on it much. Granted I generally open up Google search results in a new tab so that I could easily go back to the search results tab to click on the +1 button, chances are that's not going to happen. I understand Google's desire to use it on there really big market strength, but I just don't see it being much use. Or rather, not easy to use unless they get a "+1" button for placement on say this blog. The other thing that gets me is Google's baffling deployment of "profiles". So I read that Google was going to be deploying profiles to Google Apps users. Which is a huge announcement actually since several services are dependent on profiles, not just +1. Google Buzz, for example, is dependent on Google Profiles. Now I am not saying that Google Buzz will now be available for Google Apps because I haven't seen that announcement yet. But the fact that profiles is coming to Gapps is a very big step forward. Unfortunately, I'm not really sure of the details of this profile deployment. 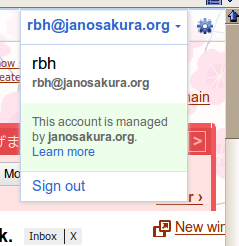 I have a google apps account both for neohawk.org and for janosakura.org. I also have a gmail google account. See the pull downs menus for each account below starting with my JANO account which has no link to a profile. The robataka.neo account works perfectly. There is a link to a profile and I can actually see it. And much to my surprise, its a new look for the profile too. Check the screenshot to the right, or click here to see my live profile. And with this new layout of the profile, my +1s are all listed on a dedicated plus one tab. I like that. What I don't like is that as far as I can tell there is no rss feed for it so I can't embed it into my own site. 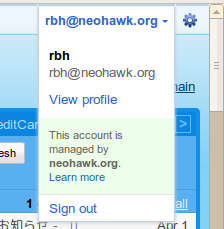 Anyway, the most annoying thing though is that on my neohawk.org google apps account it does show a profile link. And I thought "nice, I am an early bird!" and proceeded to click on it. Okay, so it's not that big of a deal since I am not really sure how I'm going to use +1 and that was the immediate motivation for seeing if I had a profile. But come on, why is there a link there if it's not available. And yes I tried logging out and deleting cookies, cache, history, etc. For what it is worth, I use several browsers, one for each google account I have so I when I did clear everything I cleared only for one browser and not for all my accounts. Back to the waiting on profiles game.